Suddenly for every Roxy reason possible it seemed imperative to make the actual Roxy By Proxy release truly special by offering this exceptionally entertaining audio aperitif. For those of you that ordered the Roxy By Proxy all those eons ago and even up til now, you can land Joe's Camouflage at a discount. Keep an eye on your email inboxes. Details will follow. Roxy By Proxy begins shipping on or around Valentine's Day. Yes it does! Space Orphans will be doing a concert at the 'Cafe Nine' in New Haven, CT, usa. Belgian jazz ensemble Moker will be doing concerts in Lokeren (BE) and in Brussels (BE) soon. Saturday, Feb 01 at the 'Lokerse Jazzclub' in Lokeren. Satureday, Feb 08 at the 'Jazzstation' in Brussels. Sjeik of the ice age (by Moker) from Mathias Van de Wiele on Vimeo. "Elohim", the sixth album by Aka Moon, got released in 1997. The album presents a collaboration between Aka Moon and Umayalpuram K. Sivaraman, an Indian mridangam player. As essential as it gets. Data has been added to the United Mutations Archives (and it completes the Aka Moon discography). Komm und stoss mit uns auf unser Baby an, es gibt ein akustisches FiDO-Häppchen, Sprudelspass & Film. 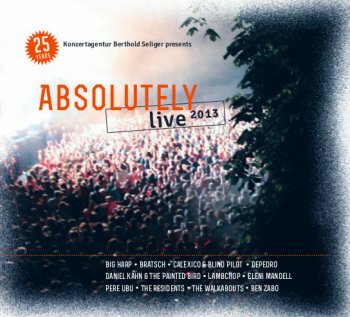 "Absolutely Live 2013" is a sampler that got released by concert agency Berthold Seliger. It presents a number of live tracks by various artists that are linked to the agency. My two favorite tracks: 'The Modern Dance' by Pere Ubu, recorded live in Manchester (UK) on April 18th, 2013, and 'My Window' by The Residents, recorded live in Rennes (France) on December 6, 2008. This Residents track has recentlry been made available in the Radio Thoreau (downloads) project. The Residents' website is showing the first dates of the new tour ! June 1981, the Kaleidoskop Band (from Germany) performed Frank Zappa's 'Concentration Moon' in concert at the 'Stagges Hotel' in Osterhol"-Scharmbeck, Germany. The concert (including 'Concentration Moon') got released on their "100% Live" album that got released later that year on the RockFarm label. Last week, I received another fine gift from my friend Bohous. 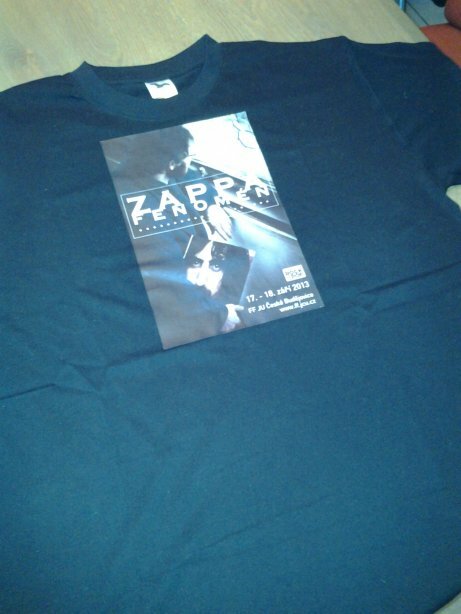 He mailed me a t-shirt of the "Zappa Fenomen' conference that he participated in. The conference was held in September 2013 in Ceske Budéjovice in the Czech Republic. Long live the Czech Frank Zappa Fan Club !! The below link gives you an opportunity to listen to Harvey Mandel's "The Snake". Participating musicians include Don Sugercane Harris and Chuck Domico ! CAROLINE - GARDEN PARTI / CAROLINE, YES! 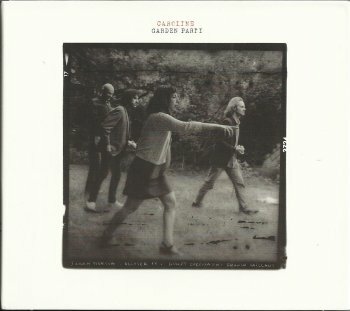 caroline: garden parti / caroline, yes! Besides being an excellent double bass player, Sarah Murcia also is the woman behind Caroline. In 2011, Caroline released a two Cd-set, presenting two different projects: "Garden Parti" is some fine jazz by the Caroline quartet, while "Caroline, Yes!" is a collection of coverversions with a varied cast of guests. Among the coverversions is Zappa's 'Caroline's Hard-Core Ecstacy'. 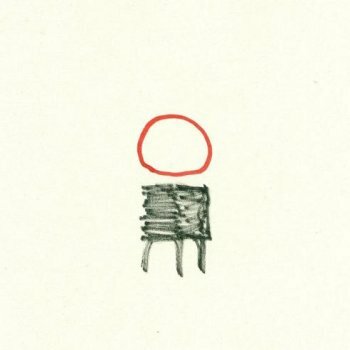 Belgian trio Dans Dans (Dance Dance) has released two albums to date. 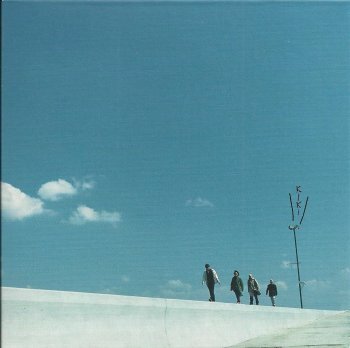 The first one got released in 2012 on record store day in a limited edition of 200 copies. The second one got released last year. Dans Dans has an excellent taste in music, so next to their original compositions, the trio performs the music of Sonny Rollins, Thelonious Monk and Sun Ra to name a few. Dans Dans' first album contained Sun Ra's 'Lanquidity' and 'El Is A Sound'. Album number two offered Sun Ra's 'Ancient Aietopia'. Orchestra Spaziale is an Italian big band. The ensemble has done a number of Zappa shows over the last ten years, and thanks to audience audio recordings, the band could be enjoyed by zappateers worldwide. Thanks to A Simple Lunch, the first official record of Orchestra Spaziale has finally seen the light of day. 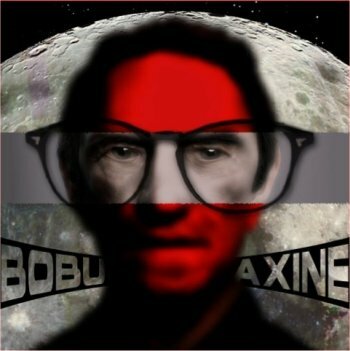 The album is intended for download (iTunes, ...), but it's also available as a CDR-release. Great packaging, beautiful artwork (by Vanni Spazzoli !!) and an incredible set of fine arrangements of Zappa music. Brand-new 2 CD set by The Residents, combining the "Maxine" and "CB Suite" projects, previously only available as downloads. Buying the CD also gets you the FLAC download. 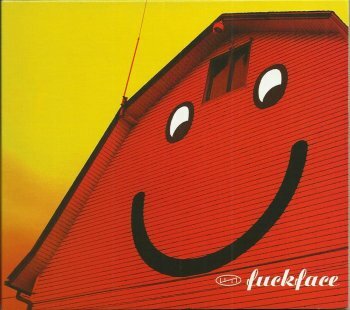 Milwaukee band Fuckface recorded Frank Zappa's 'Why Don'tcha Do Me Right?' 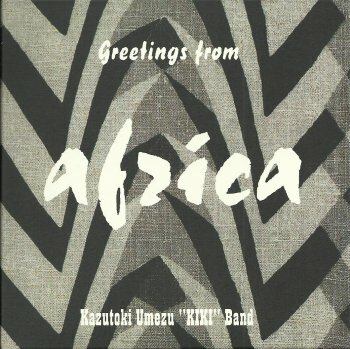 as a bonus track for the the CD-version of their self-titled debut album. The band has an interesting story (and three drummers !!). Fusion? Yes, but with quite a dose of smooth jazz as well. But I do like it. This is an excellent album. 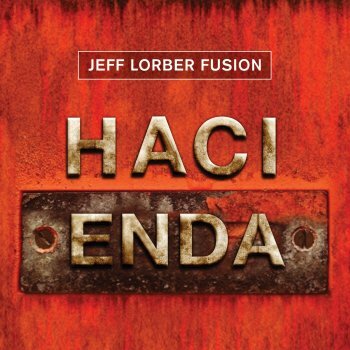 Jell Lorber is a fine composer and the stuff that he writes sounds really good. 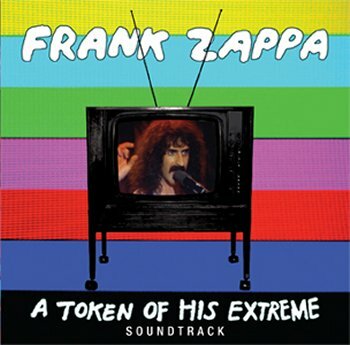 Cherry on the cake, however, is the superb version of the Zappa-penned 'King Kong' !! 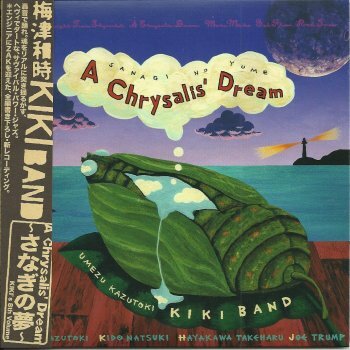 With Vinnie Colaiuta on drums (he plays on most tracks of the album), Ed Mann on marimba (he's in fine shape), and the formidable Jean-Luc Ponty on violin !! 5 minutes and 41 seconds. 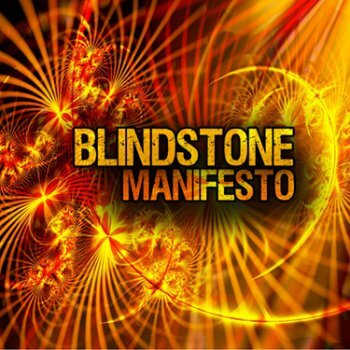 This re-issue of "Manifesto" by power trio Blindstone has a couple of bonus tracks, one of which is Dirty Love (Frank Zappa). 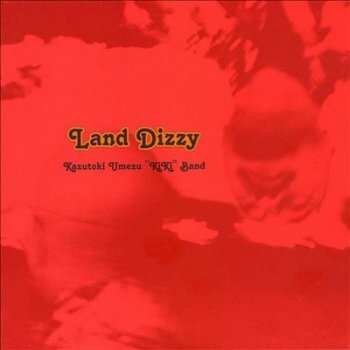 The original album (without the Zappa composition) got released in 2005. Guitar-orientated rock with Martin J. Andersen on guitar and vocals. Frank Zappa, Napoleon Murphy Brock, Ruth Underwood, George Duke, Tom Fowler and Chester Thompson. Recorded at the KCET Studio in August 1974. Ever since I've been listening to the music of Frank Zappa (and The Mothers Of Invention), the KCET TV-show has been one of my favorite recordings. The DVD with the video recording of the show got re-released a little while ago, and now there's the seperate (remixed) audio album. For me, this is what Zappa is all about. "Rad Gumbo" is a box of 13 Little Feat CDs. It's Little Feat's complete Warner Bros. years, including bonus material. 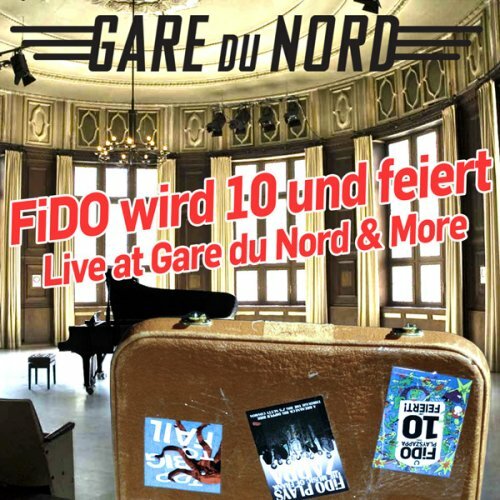 Swiss band FIDO is celebrating its 10th anniversary with a DVD-release. 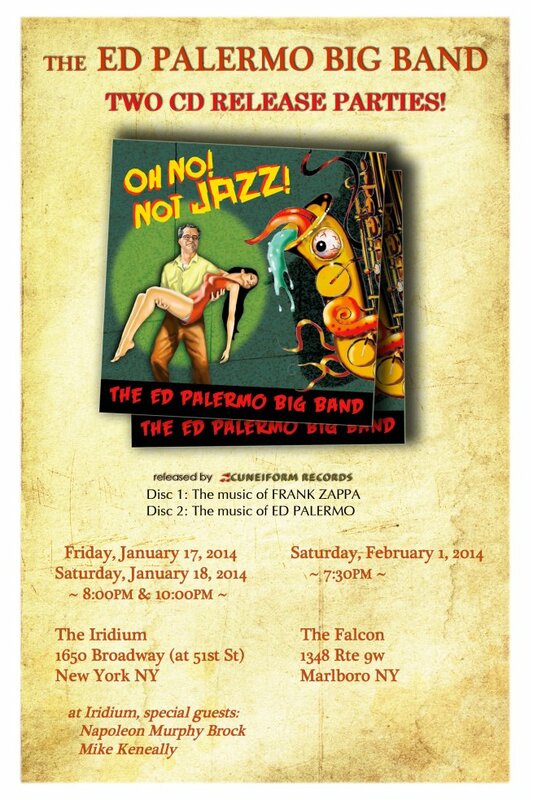 The new Ed Palermo Big Band CD will contain original material as well as a bunch of Zappa material. Out on the Cuneiform record label. Os Trabalhadores Do Comércio recorded Frank Zappa's 'Lucille' as well as 'Why Does It Hurt When I Pee?' on their "Iblussom" album. 'Lucille' is retitled 'Lucinda' and the song sounds pretty funky with the reggae groove. 'Why Does It Hurt When I Pee?' is called 'PQMDQU' and sounds quite funny. The info got added to The Others Of Invention section over at the United Mutations Archives. 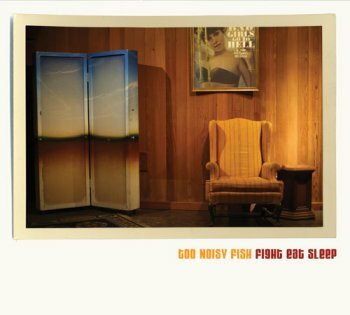 I think I already mentioned the second Too Noisy Fish album: "Fight Eat Sleep" a little while ago. After giving it its first spin exactly a week ago, I've played it again almost every day, but I do have to admit that Sunday morning seems like the best moment. Don't ask me why. Peter Vandenberghe (piano), Kristof Roseeuw (double bass) and Teun Verbruggen (drums) are also know as Flat Earth Society's rhythm section. It shows. 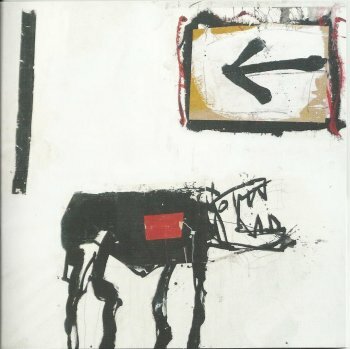 "Fight Eat Sleep" is a fine album. 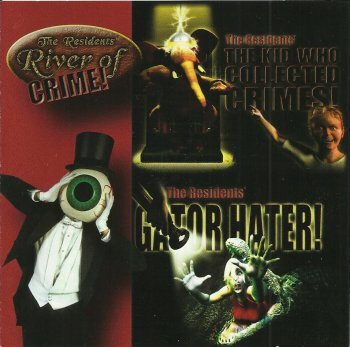 THE RESIDENTS - RIVER OF CRIME! 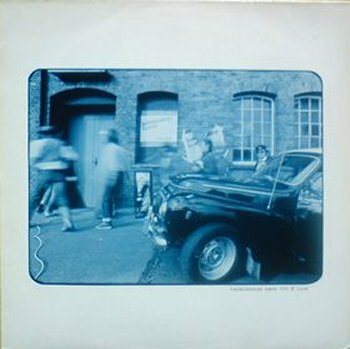 Adding data to The Residents' discography, here's a picture of the 2-track CDR-promo from Cordless Records (from 2006) to promote the upcoming "The River Of Crime!" album. Early 2006, Cordless released "The River Of Crime!" 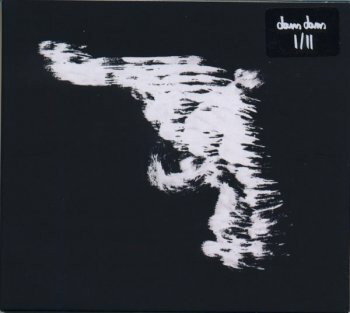 as a blanc CDR-set, with a download code. You could download the album and burn it yourself. Later, Cordless did release a regular CD-version (with an extra track). New York's Museum Of Modern Art held an on-line community art project / contest and asked people to made a video to go along with "The River Of Crime!". 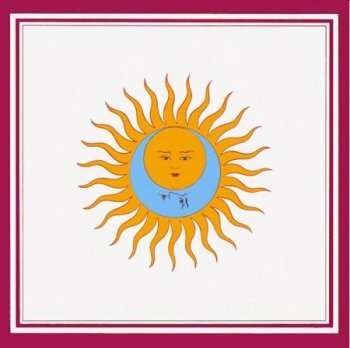 King Crimson fans could celebrate the 40th anniversary of the classic "Lark's Tongues In Aspic" album with this incredible re-release from 2012/2013. This 12" cardboard box includes 12 audio CDs, a DVD-audio and a blue ray disc. The complete set of data have been added to the United Mutations Archives. 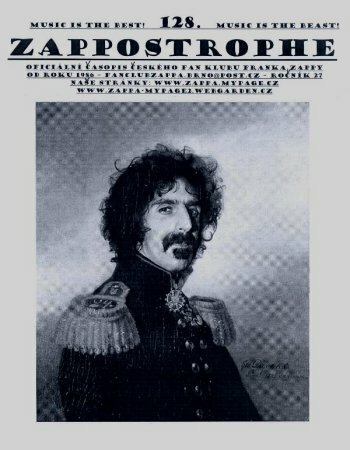 Issue number 128 of Czech Frank Zappa fanzine Zappostrophe is out !! Recorded (and broadcast on Dutch TV-show Vrije Geluiden) October 6, 2013, Nora Fischer and Claron McFadden performed Monteverdi's 'Ohimè, dov' è il mio ben'. It will get another broadcast on Sunday, Jan 12, 2014. It's part of a compilation. Sort of "best of 2013". 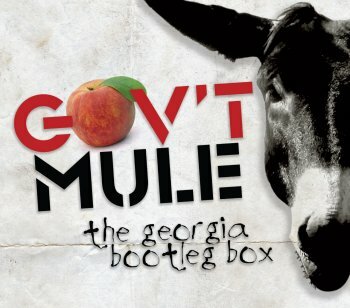 Gov't Mule always considered Georgia as the place where things started happening for them. April 11 in Athens, April 12 in Atlanta and April 13 in Macon. Each of the three show started with 'Blind Man In The Dark'. During the first show that's presented in this box, however, Warren Haynes and his friends sneaked Frank Zappa's 'Pygmy Twylyte' in 'Blind Man In The Dark'. In1995, jamband Gov't Mule recorded a track named 'Left Coast Groovies (for FZ)' on their first album. As one might expect, it does have a certain Zappa flavour. Excellent album, by the way. 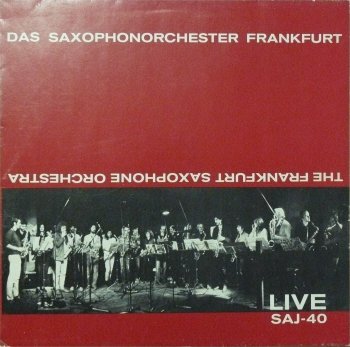 Das Saxophonorchester Frankfurt recorded Frank Zappa's 'Sofa' on their "Live" album. A vinyl album from 1982. And Frank's in good company as the band also performed material by Miles Davis and John Coltrane. Folks, we're doing it again! The last time was OFF THE CHARTS INSANE. I have a mind-blowing show all set for everybody. New album out soon : "Oh No! Not Jazz!!" Available again as the distributor found a couple of boxes of this out-of-print DVD. If you're satisfied with a YouTube version, check out the below video. If you need the real deal, hurry to the Panzerballett website. -- thanks to Chato ! douBt will be doing a late afternoon concert in Liège (Belgium) on Sunday 2014 02 23 at the Cité-Miroir. "D*CK S*AB", the Residents' cdr-on-demand with altered version of the "Duckstab" album is going out of print later this month. The 18th of January, however, a new album will be released. B13, the label that has been releasing old concerts on limited edition coloured vinyl albums, has recently released a Tom Waits concert. Graphic artist Steve Cerio designed various concert posters for The Residents. 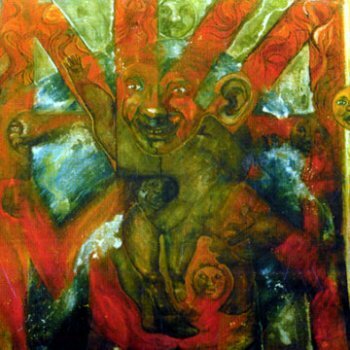 More recently, he did the album cover for the new Wicked King Wicker album, "Evolving". Out on the British Cold Spring Records label. Devin Flynn, Gary Panter and Ross Goldstein did it again. 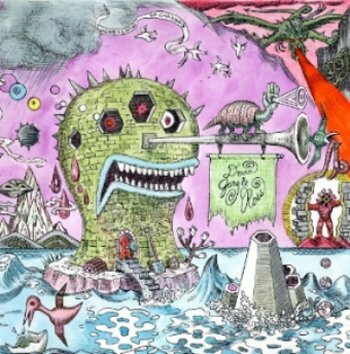 Devin Flynn is an animation artist, Gary Panter a graphic artist (who worked with The Residents and who also did a couple of Zappa album covers), and Ross Goldstein a musician. Nevertheless, these three people have been making music together for a couple of years. They even did a short tour after their previous album. Out on Feeding Tube Records. Los Angeles, CA - After a long absence from the music scene, Missing Persons featuring original vocalist Dale Bozzio will return to the Southern California stage for two special concerts at Saint Rocke in Hermosa Beach on January 10 and at The Coach House in San Juan Capistrano on January 19. Such memorable hits as "Words," "Destination Unknown," and "Walking In L.A." made Missing Persons a household name in the '80s and a staple of early MTV thanks in part to the cutting edge fashion statements of Bozzio. With her unforgettable pink streaked hair, fishbowl bra and bubblewrap jacket, Bozzio would become an iconic figure of rock fashion, the original glam diva, inspiring the likes of Madonna, Gwen Stefani, Lady GaGa, and others! Her vocal style too became a unique signifier of the band's music, and her voice remains as strong today as it was then! These two exclusive performances are an exciting prelude to the release of the first studio album of new material to bear the Missing Persons name in over 25 years! The album, titled appropriately enough Missing In Action, was produced by Billy Sherwood and will be released on Cleopatra Records, March 4. Sherwood, whose recent work on the solo album of Star Trek actor William Shatner thrust Sherwood into the national spotlight, composed the album alongside Bozzio and brought a modern twist to the classic Missing Persons's sound for what is sure to be one of the most talked about comeback records of the year. A record release party is planned and a nationwide tour will launch later in March! 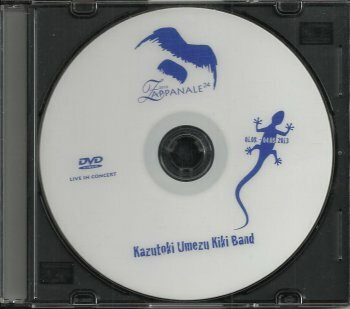 The Kazutoki Umezu Kiki Band's discography has been completed, including a scan of the DVDR that captured their Zappanale concert and that was made available at Zappanale. 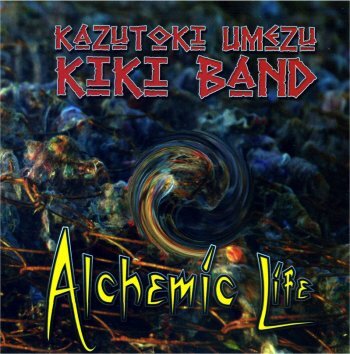 The three first albums were released on the Japanese EWE record label, while "Alchemic Life" came out on a Polish label. 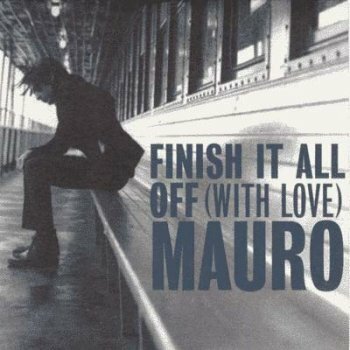 "Finish It All Off (With Love)" was taken from Mauro Pawlowski's "Songs From A Bad Hat" album in 2001. 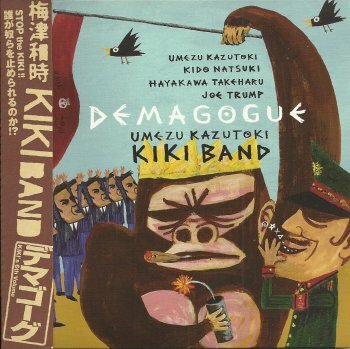 Last August, Kazutoki Umezu, Natsuki Kido, Takeharu Hayakawa and Joe Trump took the Zappanale audience by surprise. 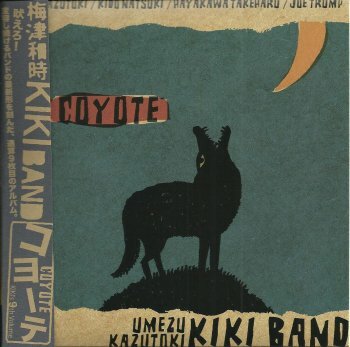 The Kazutoki Umezu Kiki Band made an everlasting impression. To make the whole event even more memorable, the band had brought five CDs along: the complete series of their Zott Record label releases. If you happen to come across any of these, you should not hesitate, this is great !! 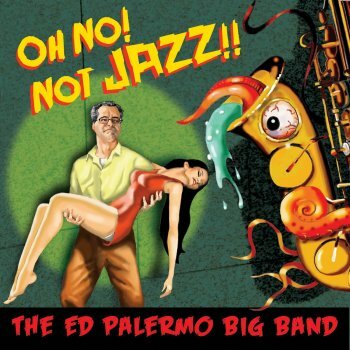 The latest Ed Palermo Big Band album is called "Oh No! Not Jazz!". Disc one is all Zappa material, with special guest Napoleon Murphy Brock, and disc two has original compositions. 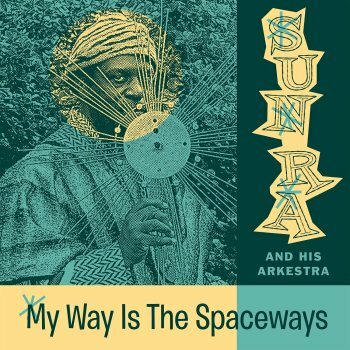 Norton Records has released the fourth volume in their Sun Ra Space Poetry Series. Four months ago, I was wandering around at Zappanale. The first days of the festival had already brought me Anton & The Headcleaners, The Dangerous Kitchen, Ali N.Askin and Sebkha-Chott. It was a Saturday, and the day had started with an impressive performance by Alli Bach on the smaller stage. Alli sang and tap-danced her way through the Zappa songbook. Beautiful. How was I to know that this was just the start of another fine day. 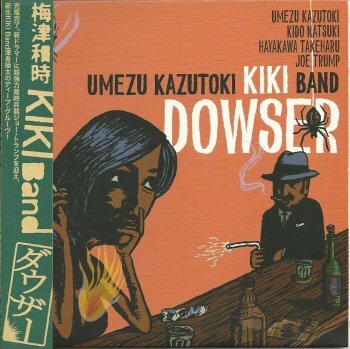 Next up was Kazutoki Umezu with his Kiki Band. At the main stage. 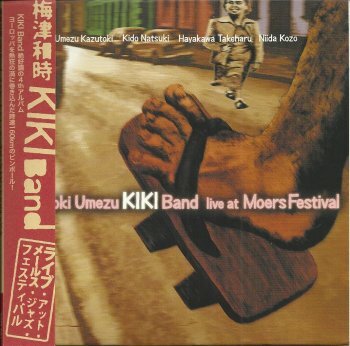 From the first notes, the Kazutoki Umezu Kiki Band had the audience in a grip. Jazz rock, fusion, progressive rock, experimental and free... All mixed into one powerful performance. This was great. Looking at the video still gives me goosebumps. 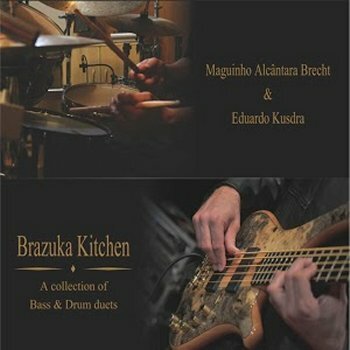 From their "Brazuka Kitchen" album, a track called 'Zappa'. 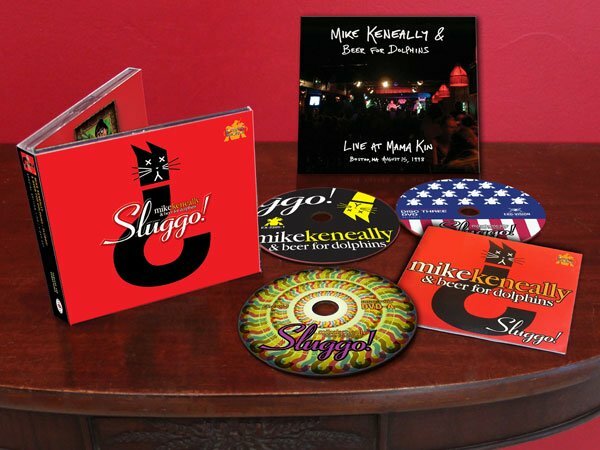 I guess I already told you about the beautiful re-issue of Mike Keneally's "Sluggo!" album? If not, well, take my word for it, this is one great package. Besides the original album, the various remasterings / remixes and bonus material, the "super-deluxe-package" also contains an extra album. And it's not just included in the "Sluggo!" package, it's a complete, seperate digipack / album. 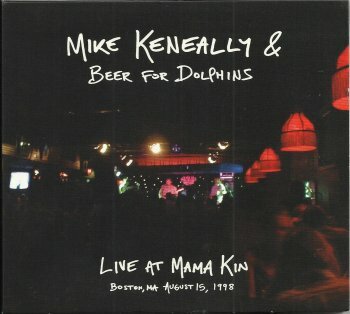 Recorded in Boston, August 15, 1998. Mike had a cold, lots of things had gone wrong (as Mike explains during the concert), but this is a great concert!! It also includes MK & BFD's supberb version of Zappa's 'Inca Roads'. 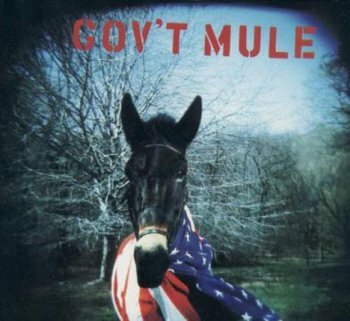 Twenty years ago, Gov't Mule frequently included Zappa's 'Pygmy Twylyte' in their setlist. It even got released on their famous "With A Little Help From Our Friends" 1998 New Year's Evening concert box set. More recently, guitarist and bandleader Warren Haynes has been putting Zappa's 'Trouble Every Day' in the setlist. An excellent choice, as they do add their own little extra to it. 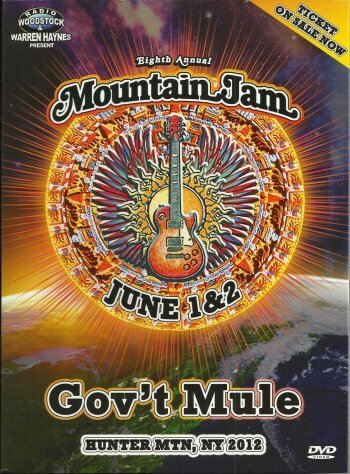 June 2012, Gov't Mule played at Mountain Jam. 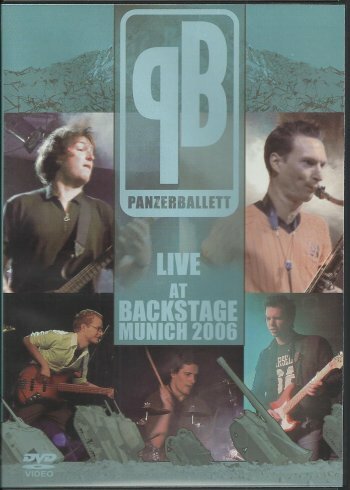 The (bootleg-)DVD that appeared a couple of months ago presents these concerts. The below video is a YouTube audience shot video from the same show. Just listen to the amazement of the guy who is recording this!! Over at the United Mutations Archives (www.united-mutations.com), I've added another set of pictures to the Zappa discography and pasted them into the various participants' discographies as well. Quite a job, but fun as well as I listend to the complete Stage series while doing so. Hadn't heard these in a while. Anyway, I guess I'm ready for the Roxy DVD now.